The next update for Xbox Live Dashboard arrives on August 11. There is also a Xbox LIVE Update Preview Program which you can sign up for to get the update early. Movie Parties – Xbox LIVE Gold members can sit together in a virtual theater with up to seven friends no matter where they are while your Avatars watch a movie, flirt or even throw popcorn at each other. Manage Your Queue – Browse the Netflix Instant Watch video catalogue, choose from the most popular movies and genres and add to your queue all from the comfort of your couch – no computer required. Enhanced Playback Experience – Enjoy a smooth viewing experience when your internet bandwidth fluctuates. Friends Info – Richer information is now displayed in the Friends channel and in the Guide showing what you and your friends are doing. Props – You can now equip your avatar with animated items they can carry around and interact with. Awardables – The ability to earn Avatar clothing and props as rewards within games has been added. Please stay tuned for an update on supporting titles. Purchase Options – Browse and download a great selection of full Xbox 360 games using Microsoft Points, direct debit, or credit card. Game Manuals – Game manuals for Games on Demand titles can be viewed, downloaded or printed on Xbox.com. It’s Yours Forever! – As with other Xbox LIVE content, Games on Demand titles are linked to your Xbox LIVE account, so you can delete and re-download anything you have already purchased to the same console or another console. Rate it – You can now rate every game on the Xbox LIVE Games Marketplace using a 5-star system. Sort and Find it – Now you can easily find the games that everyone’s been raving about by visiting the Top Rated games in the Browse All category of Xbox LIVE Games Marketplace. Party Reconnections – If you are accidently disconnected from your party, Xbox LIVE will automatically reconnect you. Streamlined Party Invites – Invites are now just one click away! No need to click through multiple screens to get all your friends together. Display Discovery – Make sure you can see and hear your entertainment in the highest resolution and sound quality possible with the option to override and select audio and video formats independent of the information your television sends to your Xbox 360 console. Gold Member Veterans – Xbox LIVE Gold members get to show it off with a stamp on your Gamer Card that tells people how long you’ve been a Gold member. Indie Games – Xbox LIVE Community Games has been renamed Xbox LIVE Indie Games. We feel this new name better represents the independent spirit of these titles. Achievement Browser – We’ve revamped the Achievements browser so it’s now easier to read through all the achievements while playing a game. You can now also launch a game directly from the browser. 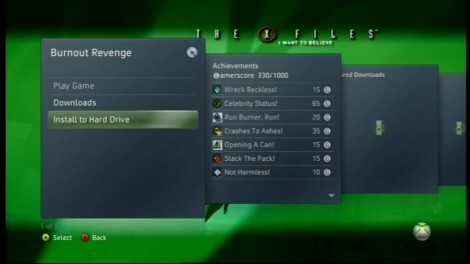 Achievements Tracking – A new view inside the profile panel which includes a summary of Achievements earned across all the games played, and shows of all your completed games. Streamlined Navigation – Streamlined navigation, including new entry points in the dashboard for Active Downloads, redeeming codes, recovering Gamertags and more. Voice Messages – No more blank voice messages! When recording a voice message, a warning will pop up if no audio is detected. Friends List Sorting – It’s now easier to find your friends! Find and sort your friends by activity, Gamertag or online status by pressing the Y button while viewing the friends list in the Guide. Memory – Time stamps now appear in the memory area, which particular handy when managing saved games. Subscription Notification – If your Xbox LIVE subscription is about to run out, you will now be notified when you sign into Xbox LIVE. Updates for Invalid Windows Live IDs – If the Windows Live ID you provided has expired, you will now be prompted to update it the next time you sign into Xbox LIVE. Account recovery – We’ve enhanced the account recovery process to make it faster and more reliable. What does this Xbox LIVE Update not include? The following features will be coming in future Xbox LIVE updates, which we’ll be sure to let you know about. I’ll try to put this to good use imemidtealy.